This is a cruise for complete relaxation, as all the locks and bridges are manned and operated for you. The route passes through the two cathedral towns of Gloucester and Worcester, together with the contrasting towns of Stourport (with its funfair), Tewkesbury (with its abbey) and Sharpness (with its docks). The porcelain factory in Worcester, the National Waterways Museum at Gloucester Docks and the Slimbridge Wildfowl Sanctuary on the Gloucester and Sharpness Canal are all worth a visit. The River Avon is picturesque with many attractive towns and villages en route. A midweek overnight stop in Stratford allows for a visit to the theatre and other tourist sites. 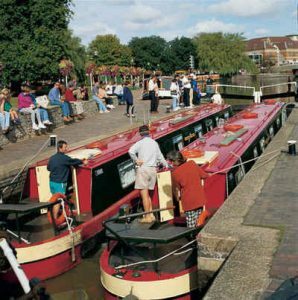 Two of the seventeen locks are manned, so the cruise is ideal for first time hirers providing just enough locks to master the skill without overexertion. This is a popular route, and can be busy during peak season, especially when searching for a mooring.